Assassin’s Creed III: Liberation breaks new ground. The main protagonist is Aveline de Grandpre. This marks the first time in the series that the main character has been a female. The developers had a chance here to create something truly special but sadly they instead made another by the books Assassin’s Creed game. The game takes place in New Orleans around the 1770s. Aveline is the result of an affair between a slave woman and a wealthy merchant. Her slave mother disappeared when she was young so her father and stepmother brought her up. She lived very well off and free of the threat of slavery. Aveline is also an assassin. Most of the story involves a mystery about the identity of a “Company Man” responsible for the disappearance of slaves and the smuggling of goods into and out of New Orleans. You’ll travel to New Orleans and to the Bayou and meet some real African folks. But there are a number of problems keeping this story from being truly compelling. The story is rushed, there are only nine parts and after you finish one part you’ll jump forward a number of years with a small text block telling you what happened in between. The writing is not good for a game that should have some emotional punch. You are an African American woman in the late 1770s you would think there would be a greater concern for the slaves you’re surrounded by but really there is no cause for concern. Sure slaves are disappearing but it isn’t implied that by solving the mystery that we will solve any slavery issue. Add on the fact that Aveline parades around wearing expensive dresses, going to parties like rich folks. There seems to be a large disconnect here. The sound design does not help matters either. The soundtrack, while alright on it’s own, doesn’t actually add to any emotion during cut scenes. Let’s just say there are major plot points that come up where some dramatic music would have helped set the tone. Instead a subtle piece of music drones on. Also, the voice acting is inadequate. Most characters are not great, including Aveline, but her friend Elise probably has the worst creole/french accent ever recorded. Her accent is a joke, meanwhile actual jokes fall flat. This game was ported from the Vita and it shows. The graphics are ugly. Poor textures are everywhere. Heck Aveline staring at you with her dead eyes is sad enough. Not a good looking game at all. Remember folks, just because it says HD in the title doesn’t mean it equates to good looking. Gameplay is your standard Assassin’s Creed stuff, same issues that were had with AC3 carry over to this game as well. Mainly the simplified free-running complicating things. New to this game, however, is a disguise feature. Aveline has three personas. Assassin persona, lady persona and slave persona, they all have their own strengths and weaknesses. The slave persona can stealthily infiltrate areas by impersonating a slave. She can free run and fight with small weapons but is more vulnerable than the main persona, the assassin persona. The assassin, obviously, can do everything, however, she’s always got a bar of notoriety so guards will always be suspicious. The lady persona is dressed like a rich person in a fancy dress. She’s the most low key persona. She can defend herself but combat is not advised and can also charm certain individuals. She can’t free run so if you fall in the water, you’ll have to swim to a ramp, you can’t climb out of the water. The persona system is a somewhat interesting idea but the missions they are used for are usually too alike and boring to play. Assassin’s Creed used to be a series about interesting locales in certain time periods. There was a thrilling verticality to the settings as well as awesome landmarks. But what is interesting about New Orleans? Mardi Gras? Sadly, not around in 1770. So what’s left? A city with a dock and some bayous. Not really an exciting location. 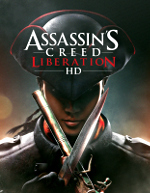 What it comes down to is Assassin’s Creed Liberation is more of the same but nowhere near the level of the other games. It’s a shame because the character had a lot of potential.